Former works World Karting Championship competitor and Formula Renault competitor. The second round of the MRF in Bahrain came around not long after the first round in Abu Dhabi, this time the MRF cars would be running alongside and supporting the WEC, GP2 and GP3 series. After visiting this circuit before, hopes were high for a good result. After seeing the program, track time was to a minimum, with only one free practice before going straight into qualifying on Thursday afternoon. Free practice, proved to be a difficult session for Laura with a brake pressure problem, resulting in lack of brakes in the heavy braking area’s. The problem was thought to a leak on the brake line, but once going again they realized that the problem hadn’t been resolved prior to qualifying. Overall Laura was happy with the progress made in the session and felt she had more to come from herself and the car for the next time out on track later that evening. After a 5 hour wait from free practice to qualifying, all was run under flood lit conditions. Laura stated afterwards “When I got out on track, the car felt great, times were looking good and we was sitting inside the top 6, but then I had a strange feeling from the car and then started to loose time, especially in the high speed corners on around lap 5”. When all drivers had returned the garage, it was found that Laura had actually suffered a broken left rear wheel nut, meaning the wheel was left attached by only the safety clip.Due to this loss of speed and still a problem in with the soft brakes, the times didn’t progress anymore resulting in Laura qualifying in a disappointing P15. Friday morning arrived, Laura was looking determined to make up for the unlucky qualifying issue, and having to start in P15, she had nothing to loose. Laura got a great start making up 3 positions by the first corner, as she entered into turn 2 the car oversteered suddenly when only a little throttle was applied, resulting in a spin. Once back facing the right way, Laura got her head down and started chasing down the pack, which not only showed with lap times, but clearly visible was that she was honing in on a 5 car pack, until once again the demon of bad luck struck the 24 year old, as she was at top speed entering into turn one when a blow out on the left rear tyre brought race 1 to a early end. Once again a long break between race 1 and race 2 gave Laura time to reflect and go through all car and track data required with her engineer, working hard to improve the car for the final race of the week. Race 2 once again under floodlights, was a good atmosphere, and Laura was going all out to grab a positive to take away from this week of mechanical issues. As all was set for race 2, Laura once again bagged a great start, moving up around 4 positions in turn 1, but once again in turn 2 the rear tyres became slippery and oversteered uncontrollably, causing Laura to spin off track and getting the rear wheel caught in the gravel. Laura did well to keep the car running but having to wait for the marshals to help her out meant a huge loss in time and also the rear wing was pushed forwards whist trying to get her back out the gravel, this meant a lack of straight line speed for Laura and for the remainder of the race she was half a second slower due to the wing, but Laura had found a whole second within herself putting her top 6 on the times. This was a great positive to take away from a not so lucky weekend from Laura. Now that Bahrain is completed Laura is now focusing and working hard for the 3rd round out in Dubai in mid December, hoping that all issues have arisen now, and at the halfway point of the season results will turn on there head and prove just what she has in the bank when the equipment allows it to be shown. This entry was posted in 2015, Racing News, Uncategorized on December 10, 2015 by admin. Once again Laura was at the top of the time sheets, nearly always in the top 6. Qualifying went very well with a 4th best time. In Superpole she came in 6th. Portimao finished with a 16th in the first final and a 20th in the second. Technical difficulties hampered the results, which is disappointing when there is so much speed in the chassis and effort put in by everyone in the team. Laura is getting quicker at every European event and qualified on grid 16 for the pre final, finishing the main final in 12th. this was here best result of the year and shows that she has become one of the fastest drivers in the country. Laura makes it to the final of a WSK event for the first time. The first round of the World Championship at Wakersdorf saw rain appear just as Laura took to the track for qualifying on slicks this put at the rear of the grid and the results below just show how tough it was to get through in this high caliber race. Laura Tillett welcomed an inspirational group of race goers from CLIC Sargent, the UK’s leading cancer charity for children and young people, to Donington Park on Sunday, 19th August, where the 21-year-old was in action in the Protyre Formula Renault BARC Championship. 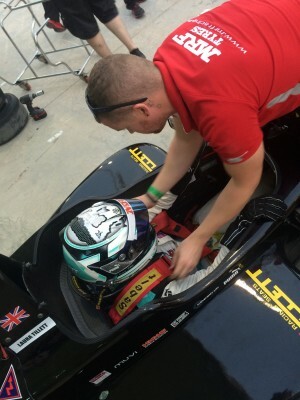 Laura Tillett, one of the hottest young prospects in UK motorsport, will make her car racing debut in the Protyre Formula Renault BARC Championship this year having chosen to pursue a career path in single-seaters – with the ultimate goal of climbing the ladder all the way to Formula One. Eighteen year old Laura Tillett is the daughter of renowned kart seat manufacturer Steve Tillett. Laura has been a constant fan of Motorsport from the first day she watched her father competing in the British Formula “A” Kart Racing Championships during the early 90’s. Laura was unfortunate to get a flat tyre in the pre-final so she had to start from the back of the grid. She eventually came through to 7th in the main 25 lap race. A big thank you to CRG for their support in 2011. Quick all week Laura was constantly upsetting some of the established works drivers at La Conca. After getting a 15th grid in the final a typical karting fist corner pile up took her out in the first race but she recovered to 17th in the second final. A rising motorsport star Laura Tillett made an impressive and highly encouraging test debut at the wheel of a Renault Clio Cup race car at a rain-hit Brands Hatch on Tuesday, 24th January – so much so, the 20-year-old is now focusing her efforts on securing a 2012 race deal in the championship. Laura’s picture of her driving the Tonykart in last years race is all over Macau as she begins her campaign in China aiming to finish the year on a high. After having a motor blow up in the heats it was going to be a tough race from grid 15 but Laura survived the intense competition and got to 13th in the pre final. She finished a creditable 9th in the main final. She finishes 11th overall in the Super KF WSK Euro Championship.